I have a German Shepard male who will be 2 in April....We have had him since he was about 7mo.old...I feed him, brush him and take care of him..He is an outside dog. We live on a big farm and have 3 other german shepards..One is 12 yrs old and the other two are younger than him but were her before we got him....Yesterday as I left for work, he stood in front of the door growling at me..
Everytime I open the door he growls and growls and the hair stands up on him and he holds his tail straight up...He is fine when I get home...but when I get home and go inside if I open a window and look out he growls or if I start to come out the front door!! What the heck???? Quite strange. I would definitely get your dog to a vet and have him checked to make sure there is no underlying cause for this sudden change in behavior. Next I would suggest you talk to a dog trainer(s) about this asap and see what they might suggest but I would seriously not overlook this issue and just hope that it gets better on its own. Get help soon! At 2 years old a shepard has matured & he is trying to find out where he is in the pack.Try telling him no & see what happens.You need to stand your ground & show him you are the leader of the pack.Is he nuetered?If he is going to end up being overly aggressive than you might want to think about nuetering him,nuetering an aggressive dog will take half the aggression out of him. 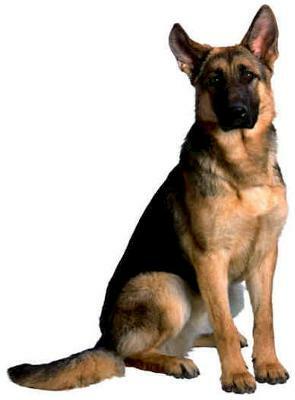 If your GSD looks that threatening and growls at you , you need to protect yourself. He may not mean to but he must have a problem either medically or mentally. You are no match for a 100 lb GSD and that be a red flag, that could be something in itself that he weighs that much, get help. I agree, you do need help asap! there's plenty of options out there, It'll be best if you get help from an expert.